SCOTTSDALE, Ariz. – Feb. 4, 2016 – The auction arena at Barrett-Jackson, The World’s Greatest Collector Car Auctions®, was the most coveted ticket for some of the biggest names during its 45th Anniversary Auction from Jan. 23-31, 2016, at WestWorld of Scottsdale. Luminaries from Hollywood, professional sports and business helped make the event the biggest party in the car collector world. This year’s Opening Night Gala was among one of Barrett-Jackson’s most epic events in its 45–year history. With the help of Acura, this year’s gala sponsor, Barrett-Jackson surprised guests with an acoustic performance by three-time Grammy award-winning country music artists, Zac Brown Band. The band rocked out to a full arena for the invite-only event after recently wrapping up their largest North American stadium tour to date. Other Hollywood A-list celebrities at the event included Jay Leno and Frankie Muniz. 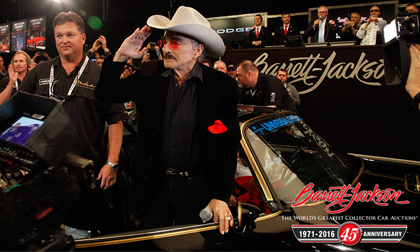 In one of those special Barrett-Jackson moments, “Eastbound and Down” played as the original 1977 “Smokey and the Bandit” movie promo car (Lot #7004) carried movie icon Burt Reynolds onto the stage. The famous Pontiac Trans Am sold for a world record $550,000 and is headed to John Staluppi’s Cars of Dreams Museum in Florida. Another incredible Hollywood moment happened when Transformers stars Optimus Prime (Lot #1325.1) and Bumblebee (Lot #1325.2) were introduced with powerful video presentations produced by director Michael Bay. Bay was on the block and offered walk-on roles in the next Transformers movie to the winning bidders of the vehicles. In addition, some of the most successful business leaders convened at Barrett-Jackson Scottsdale. The roster included Mark Fields, president and CEO of Ford Motor Company; John Mendel, executive vice president of American Honda; Roger McCormack, Director Performance Motorsports for Chevrolet, Buick, GMC and Cadillac; Gerald Johnson, GM Vice President, Operation Excellence; and Steven J. Hill, who is North America Vice President at General Motors. “Only at Barrett-Jackson can you rock out with Zac Brown Band, listen to Jay Leno crack jokes, see a Hollywood legend like Burt Reynolds and then chat with industry executives,” said Jackson. For full results of the event, follow the link to www.barrett-jackson.com.